Every day the forces you generate when you bite or chew can exert enormous pressure on your teeth. And day after day your teeth remain stable and secure, thanks to an intricate system of periodontal ligaments, attaching gum tissue and bone. The latter element is especially important — healthy bone makes healthy teeth. And vice-versa — the same biting forces are transmitted through the tooth root to the bone via the periodontal ligament to stimulate new bone growth to replace older bone that has dissolved (resorbed). If a tooth’s missing, however, the bone doesn’t receive that stimulation, and the resorbed bone isn’t replaced at a healthy rate. In fact, you can lose up to a quarter of bone width in the first year alone after tooth loss. And this can cause a problem when you’re looking to replace that missing tooth with what’s considered the best restorative option available: dental implants. Known for their life-likeness and durability, implants nonetheless need sufficient bone to anchor properly for the best outcome. Without it, implants simply aren’t practical. But that doesn’t have to be the end of the story: it’s quite possible to regenerate enough bone to support implants through bone grafting. Bone material from the patient (or another donor, human, animal or synthetic) is placed under the gum at the missing tooth site to serve as a scaffold for new growth. The new bone growth will eventually replace the graft material. The size of the graft and extent of the procedure depends of course on the amount of bone loss at the site. Loss can be kept to a minimum, though, if the graft is placed immediately after a tooth extraction, a common practice now. After a few months, the bone created through the graft is sufficient for supporting an implant and gives you the best chance for a beautiful outcome. If you’re considering an implant for a missing tooth, you should schedule a consultation appointment with us as soon as possible. 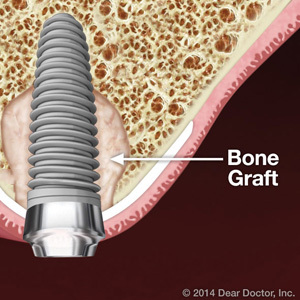 After a thorough dental exam, we’ll be able to tell you if bone grafting to support implants is a good idea for you. It adds a little more time to the overall implant process, but the results — a new, more attractive smile — will be well worth it.